Home » Service » The BIG GAME Is A Sirens Super Party! Sunday February 3rd! 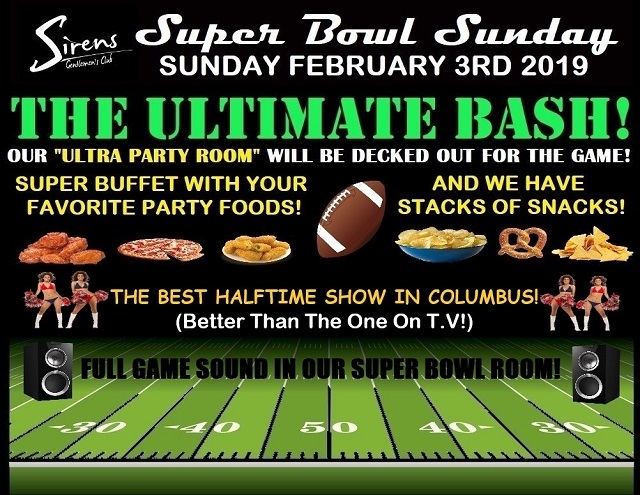 The BIG GAME Is A Sirens Super Party! Sunday February 3rd! Join us on Sunday February 3rd for our Giant Big Game Party! We’ll have your favorite super bowl snacks like nuts, pretzels & chips PLUS a fantastic buffet with all of your favorite bar foods like chicken wings, meatballs, etc. and Pizza! SATURDAY APRIL 27 – Easter VS. Barthelemy! Saturday April 6 – Bare Knuckle Beatdown! $14 Bucket Nights – Sundays & Mondays! UFC 234 – SATURDAY FEBRUARY 9TH!